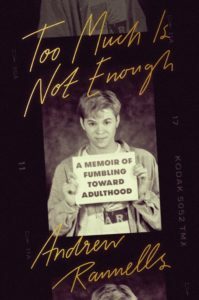 From the actor, singer, and performer best known for originating the role of Elder Price in “The Book of Mormon” and playing Elijah Krantz in HBO’s “Girls” comes Too Much is Not Enough: A Memoir of Fumbling Toward Adulthood. The book chronicles a Midwestern boy’s experience of surviving bad auditions, bad relationships, and some really bad highlights as he chases his Broadway dream. When Andrew Rannells arrived in New York City from Omaha in 1997, he was 19 years old and just out of the closet, armed with dreams of love, new beginnings, and Broadway. From horrible auditions and behind-the-curtain romances to landing his first gig in “Hairspray” and losing his father at the height of his ascent, Rannells captures what it takes to pursue your passion when there’s no roadmap provided. Funny and bighearted, Too Much is Not Enough is an intimate look at love, loss, and the powerful forces that determine the people we become. A Tony nominee and Grammy winner, Rannells’ credits across stage and screen include Broadway hits “Hedwig and the Angry Inch” and “Hamilton,” the TV show “The New Normal,” and the films The Intern and A Simple Favor. In conversation with David Litt, a speechwriter for President Barack Obama from 2011 to 2016 and author of the New York Times bestseller, Thanks, Obama. Book signing to follow.